Here at the head of the Hvalfjörður the old trails leap off across country. 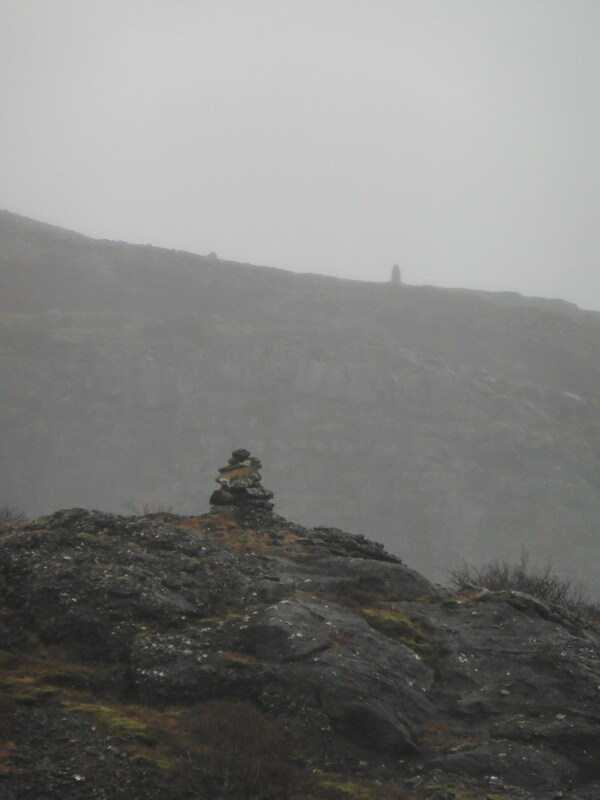 The old cairns remain, to still mark the way in bad weather, or good. As you can see, there’s a chasm between cairns. No amount of scrambling is going to make that worthwhile. You’re likely to break a fetlock, or worse. Reading these cairns is not a matter of following straight lines. Obviously, the rock, the cleft and the sky are part of the trail, too, and the reading is a way of orienting oneself in multi-dimensional space, not map space. If you’ve ever read an Icelandic novel, you’ll recognize the pattern! This entry was posted in Art, Land, travel and tagged Cairns, Iceland, map-making on February 8, 2019 by Harold Rhenisch.